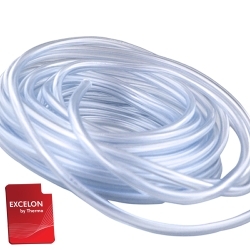 1" ID X 1-1/4" OD X 1/8" Wall Clear Beverage Tubing | U.S. Plastic Corp.
1" ID X 1-1/4" OD X 1/8" Wall Clear Beverage Tubing has a maximum pressure rating of 20 PSI @ 73°F and a minimum bend radius of 5-1/8". Meets FDA, 3A, and NSF criteria for plastics contact with food and beverage products. Durometer is 63 Shore A, specific gravity is 1.20, and tensile strength is 2,300 psi. Temperature range is from -49°F to 165°F.